I know the sound of that long steel pole from at least a block away - a distinctive metal “clink” each time it hits the street - so I always get an advanced warning when Mr. Hiep is making his rounds. He’s a role model to me - I wish I was like him: He’s got precious little to be grateful for, yet every time I meet him it’s as if he owns the whole world! 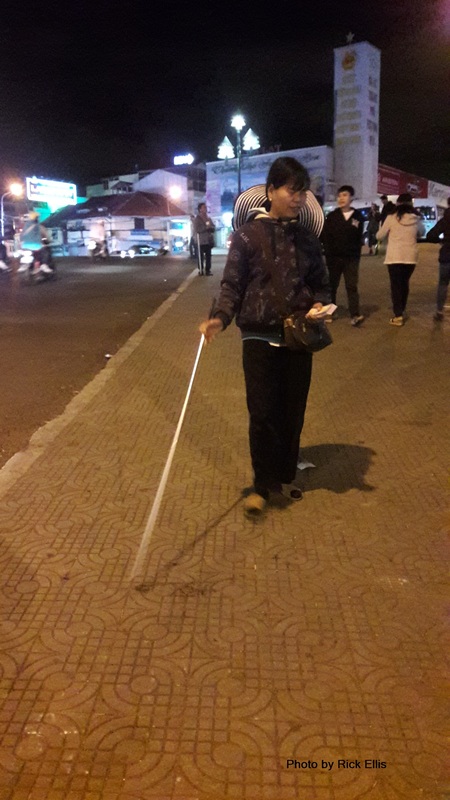 He’s totally blind, relies on his other senses and memory to get around the center of Da Lat. There is a particular cadence to those “clinks” so he can estimate where he is within a few steps at any time during his route. The steps and clinks of the pole between key milestones are memorized, such as the lottery stand where he gets his tickets, restaurants and cafes, and strategic places where he stations himself to sell tickets to passersby. Sometimes his rhythm gets interrupted - by a parked motorbike or other obstacles - and he stops. I can see him listening, concentrating, trying to figure out where he is. Then something will tip him off and he sets sail again having figured out his location. He’s as sharp as a tack, I guess some of it comes from the decades of dissecting the sounds, bumps in the road, random obstacles, electricity poles, voices, odours, and the touch of those he knows, all without an idea of what anything looks like. I also know for sure he’s sharp because he understands everything I say in Vietnamese first time around, instead of shooting me a quizzical look the way nearly everyone else does. I’ve always hesitated to write about Mr. Hiep - there’s nothing worse than fake sympathy or hollow friendliness. The fact is he’s irresistible - a magnet, always sporting the same huge grin. Everything he says and does comes out funny, just one of those people who exude positive vibes and energy. No matter what he says I can’t stop a smile from breaking out on my face. I bumped into him recently while he was exchanging small bills for larger ones at the banh mi stand. The banh mi lady Miss Han took all his scrunched up VND1,000, 2,000, and 5,000 notes and organized them - she needs them for small change and Hiep gets lots of them when selling tickets. Hiep knows them by touch, they’re papery compared to the larger denominations, which have a plastic texture. Those small notes are all the same size so I doubt he can distinguish between them, but when you get into the VND 10,000 and larger notes they all have the same plastic feel with only nearly imperceptible differences in size. I wonder if he can distinguish between them? 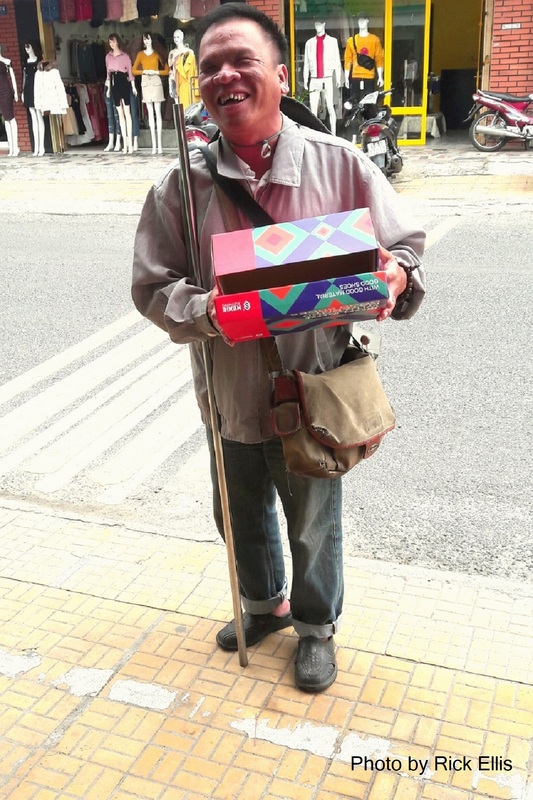 I bump into him all over the place - soup stands, restaurants, at his headquarters beside the Diamond Hotel, over by the stairs leading down to the night market which is the outside border of his patrolling area, and along Nguyen van Troi Street. Another reason I admire Mr. Hiep is he’s out and about doing something in the world, and he never misses a day on the lottery beat. I respect him and his teammates. 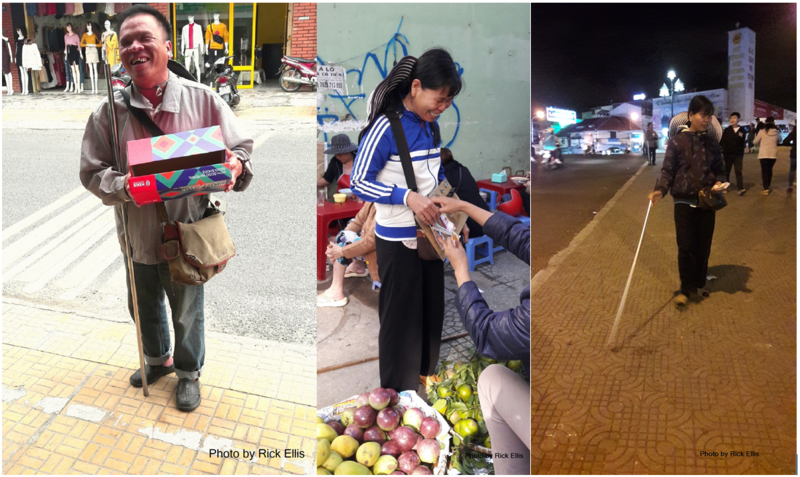 In many other countries people with his disability sit on a corner begging or receive assistance from the government, but not in Vietnam. Everybody in Vietnam does something useful it seems, however constrained they are by age, size, or disability. For the most part it’s still an era without handouts, so people use their creativity and energy to make ends meet, there is no alternative. It is with great intrigue that I note that Mr. Hiep has a sidekick - Miss Le. They used to patrol around together but recently I see less of Le and more of Hiep on his own. I think she has another initiative on the go - perhaps making a product to sell? Miss Le is the female equivalent of Hiep - they’re like twins - the same enormous grin dominating her face. She’s sweet - even beyond sweet, the beauty and love oozes out of her. To her everything is appreciated, she’s grateful for all she has, it’s evident in every move she makes and all she says. She knows me as “Mr. Canada” as does pretty much everyone in the neighbourhood where I live, and, miraculously, she also grasps everything I’m trying to say in Vietnamese no matter how badly I butcher the pronunciation and tones. Miss Le has a lanky, shy, barely teenage daughter who I have bumped into on the street with her a couple of times. Le was bursting with pride the first time, and took my hand, touching it to daughter’s forehead, as a blessing. The best part is Le’s daughter speaks English so I asked her to describe me to her mother so she could imagine me as I am. It strikes me as unfair that I can see the blind vendors but they can’t see me so I was thrilled that daughter could give mom an idea of how I look. I first latched on to Hiep and Le about a year ago, near the long staircase that leads down from Hoa Binh Theater to the Night Market. They were together where several streets intersect, a strategic location for sales. They were discussing something, then Miss Le took off in the direction of the shops that line the street around Hoa Binh. She took a route as straight as an arrow for a couple of hundred meters, then disappeared from sight. She finished her errand in a few minutes, then returned, arriving back at the exact point from which she embarked, never deviating from her outbound tack, landing right in front of Hiep. I was watching the whole thing and no words were exchanged as Le approached, she just tapped her wooden cane and landed on the bullseye. From that moment on I was mesmerized. Who are these people? How could she pull that off? How much can they really judge surroundings and walking routes? Why does Hiep have a steel cane while Le’s is wooden? Do they tap signals and messages to each other? Are they related? Spouses? Since then I’ve learned more about that team of blind vendors, but it’s just the tip of the iceberg. Several of them live together further down Nguyen Van Troi, which my motorbike taxi friend confided to me because he often drives them home when rain suddenly hits. The other morning I bumped into Le picking out fruit in the little street market beside where I live, grinning from ear to ear as always. The fruit vendor combed through every damned mango to make sure that Le got the best and freshest, then took the money out of Le’s bag and gave change. I was ready to intervene and pay, but hung back and observed instead. Like most people functioning with a disability the blind lottery team must be proud of their ability to integrate despite obstacles. So on one hand I wanted to share and help, but on the other I didn’t want my little gestures interpreted as being patronizing. If living in developing countries has taught me one thing, it’s that the richest are those who have the least because they are grateful for what they have. That’s another reason why I’m so stoked every time I bump into Hiep and Le - they give me a lesson in gratitude and remind me that attitude is everything in life.